In the heart of downtown Windhoek, two streets intersect at a large roundabout that houses an old Lutheran church. It’s an otherwise normal, nondescript arrangement, save for one small detail. Now, I’ve seen some goofy and funny street names in my day, but this pairing has to rank as one of the quirkiest; Fidel Castro Street and Robert Mugabe Avenue, named respectively after Cuba and Zimbabwe’s iconic dictators. Apparently, Namibia’s first president had befriended the two during the country’s struggle for independence. An interesting tidbit, I thought. Behind Mongolia, it is the world’s least densely populated country. A third of the population speaks German. Mining accounts for 25% of the economy. Currently, it’s the world’s fifth largest producer of uranium. The Namib Desert is the oldest desert in the world. The Namib Desert is home to the highest sand dunes in the world. Shiloh Jolie-Pitt, the daughter of Brad and Angelina, was born in Namibia. Disclaimer: the learning of interesting and awesome things is good for your health. Vegetarians beware; Namibia is a nation of meat eaters. One place in particular, Joe’s Beer House, is notably light on the vegetables. A large, quasi-outdoor expanse just outside of Windhoek’s city center, Joe’s Beer House is the place to go if you’re looking to expand your culinary repertoire. Check out the menu! I opted for the Bushman Sosatie, a “variety of ostrich, crocodile (when available), zebra, kudu and chicken meat, served with corn fritters, sour cream and salad.” Each meat had it’s own unique flavor. The chicken tasted like chicken, of course. 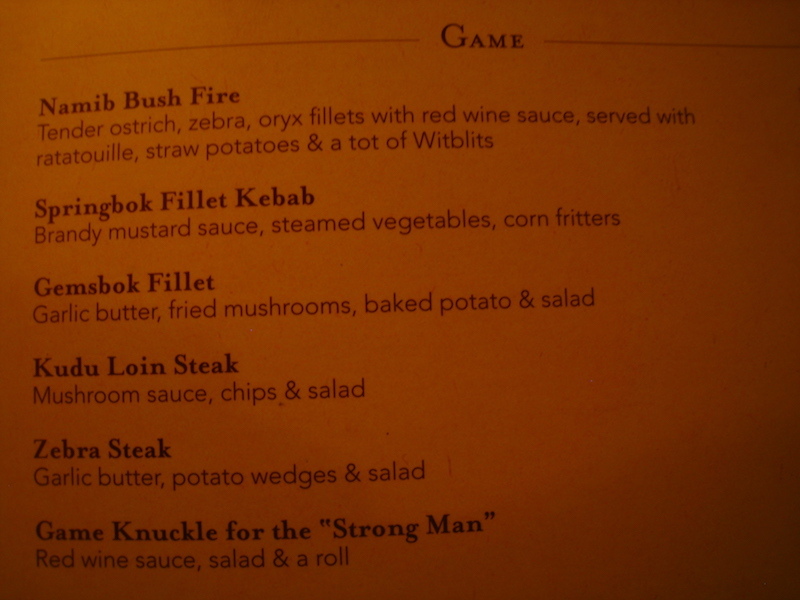 The zebra was light and flavorful, the ostrich rich and beefy. The prices were surprisingly reasonable, the beer cool, the atmosphere inviting, just the kind of place I feel good about recommending to a fellow traveler. I must say, though, that I went almost an entire week without meat after that meal. It’s an overwhelming experience. Be prepared. Always in the mood to escape city life and thrust myself into Mother Nature’s open arms, I traveled five hours outside of Windhoek to go sandboarding. From Rhino Park in Windhoek, I paid about $15 to ride in a fifteen-passenger van. It was nice, not as crowded as I had anticipated. Cruising down the B2 highway, we passed Karibib and stopped in Usakos, where I bought three samosas, a coke, some juice, a Nestle bar and some chocolate covered raisins. I like to travel in style, folks. As we entered the desert, the landscape became more distinct; distant and undulating hills, sun-bleached shrubbery, the occasional craggy outcropping. Termite mounds, reaching up from the cracks like long, skinny fingers, sporadically spaced out amongst the brush. It was ragged, dusty, seemingly endless, Namibia’s own sandy heart of darkness. The van stopped again in Arandis, a small town adjacent to a much larger uranium mine. The driver, who had been towing some luggage behind the van, stopped to unload some items; two tires, a mattress, an HP printer, and three very large, industrial-size bags of clothing. 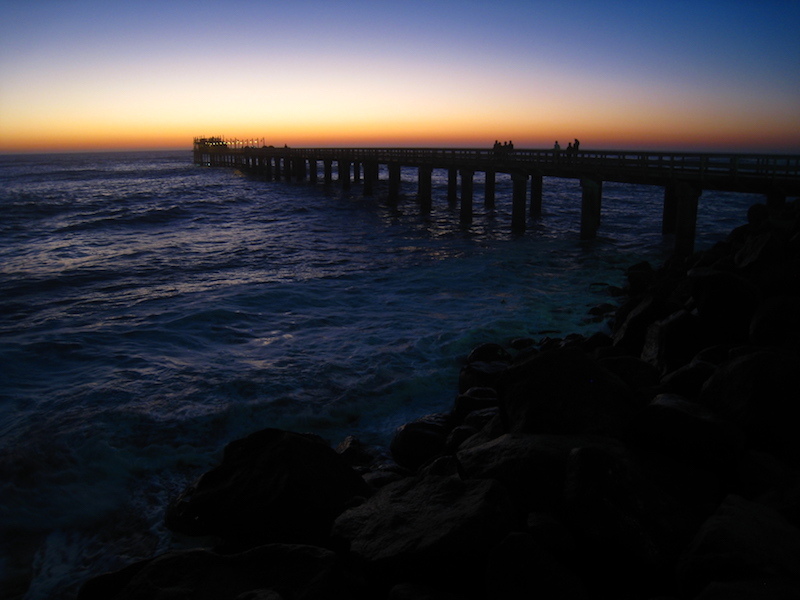 We arrived in Swakopmund just as the sun was setting. Due to the location of the shoreline–where the Atlantic’s cold water reaches Africa–there’s often a thick fog that covers the road, but that evening it was clear and temperate. I checked into the Desert Sky Lodge and ran down to the beach. It was a Sunday night and the city was quiet. I found a German pub, had some beer and fish and walked back to the guest house. The next morning, I was picked up at 9:30a by Alter Action, a Swakopmund-based adventure company. I hopped in a van with a guy from Portland, Oregon and was soon joined with a group of overland travelers from the U.K. and Australia. Fifteen minutes later and we were on site, at the base of the dunes. Instead of traditional sandboarding (standing up on a waxed snowboard), I opted to lie down on a flexible wooden sheet. I was told I’d go faster, be able to ride longer dunes and, since I’m not too comfortable on a snowboard, I’d have more fun! It was fun indeed; on the steepest run, I reached a speed of 74km/hr (46mph). This is what it looks like. It was a once-in-a-lifetime kind of morning. That afternoon, I found another passenger van that drove me back to Windhoek. I arrived just after dinner and went back to work the next morning. The summer of 2008 was the last time I paid for a haircut. I was in Istanbul, traveling with my brother and some friends, and a guy named Mustafa worked his magic. I looked all slick and European. I miss that haircut. Since then, I’ve had this routine of letting my hair grow long, buzzing it, letting it grow long again, buzzing it, etc. Back in Windhoek, in an unseen dash of spontaneity, I walked into a German hairdresser and got myself a haircut. The barber did a much better job than I’ve been doing the last couple of years. Maybe it’s time to stop buzzing my head. Have any of you gotten your hair cut on the road? Any interesting or funny experiences? After reading my friend Earl’s tribute to underarm shaving, I wonder how many more wacky stories I might be able to round up. Care to share? I’ve gotten two straight edge shaves in my life—both in Cusco, Peru, in the shadow of Machu Picchu. The first was in 2006, and the other was just this past May. In some places, it’s actually cheaper to have someone lather you up then it is to buy a decent razor! And you can always count on some interesting barbershop conversation. Sandboarding looks incredible! 46 mph is so legit man. Did you get scared at any point? I know I would have been a little nervous going that fast. Good to see you’re not running around working every day while you’re overseas! After watching the video I’m ready to do some sandboarding myself. So I guess it was worth the 5 hour trip each way? It reminds me a bit of volcano boarding, but without the torn flesh and dripping blood that result from sliding over volcanic rocks. Alan, I don’t read your blog enough, but it must have been my calling to do so today when I got bored, went to your site, and saw HAIRCUT in the title. You nor your brother got a haircut from Mustafa, but I’m glad we all remember his name. He only cut my hair and he took his sweet time doing it. Amazingly, it took longer than you and your brother being trimmed by “the other guy” combined. It has had a similar lasting impact on me, though I have yet to cut my own hair (I’ve seen Justin butcher his own head a few too many times). Since that haircut, I haven’t gotten groomed by the same person more than once. I have been on an endless mission to discover the perfect barber. I’m currently in L.A., let me know if you’ve heard of any reputable stylists. I’d love to be able to pull off another fohawk. @Dan: Ooh, never had a straight edge shave before, but can certainly relate to the high cost of razors in some countries. A 4-pack of Gillette Mach 3 blades was over $20 in Angola! @Nate: Nervous indeed. During a slower run, I fell on purpose just to see what it would be like, then realizing that sand doesn’t hurt nearly as much as snow (it makes up for that with its invasiveness), the fear subsided. @Earl: Definitely worth the five hour trip. Wishing I had more time in Swakopmund, as skydiving is pretty cheap, and the tour of Sossusvlei is supposed to be phenomenal. @Steve: Steve! Damn my memory! Thanks so much for taking the time to comment. Your haircut was certainly the best of the three, and that picture you included is priceless. Didn’t Mustafa singe the ear hair right off of you? That’s a quality I’d keep an eye out for in your mission to discover the perfect barber. Hope you’re doing well out in L.A. and that our paths will cross soon. What a privilege to be your Pops! So pleased to see you had such a successful sandboarding experience! I tried it in the dunes in Lancelin, a small town just north of Perth, Australia. I sank so hard. It was like trying to sled with an inch of snow on the ground…you want it to happen so badly but it just won’t work. Anyways, one of my friends recommended your blog. I like what you’re up to here. Good luck! Good call on the sandboarding. We did it in Peru and stood up. we thought we’d be great because we snowboard. We tried to carve our way through the sand and went pretty slow. After a while we decided to lay on our boards and it was so much more fun! You are right, you go much faster. Their boards look like the crazy carpets we use here in Ontario to go tobagganing in the wintertime. Dave cuts my hair on the road. His first cut he put my hair in a ponytail and snipped it off. It ended up being extra short in the back and long in the front. Once he played around a bit it turned out great! He has become an expert at cutting my hair, so much that I don’t bother with hairdressers even when I come home now:-) I have my own personal Vidal Sassoon.